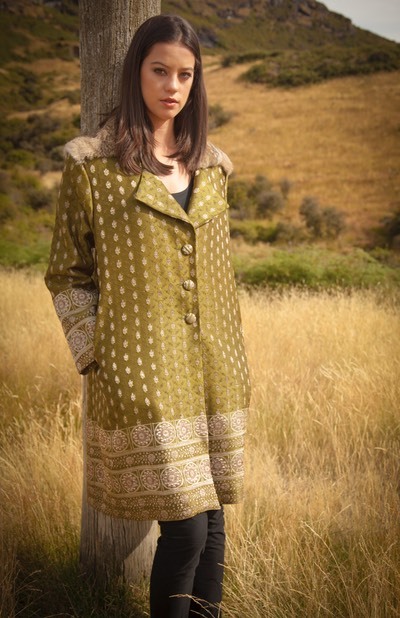 This coat realises the wonderful potential of vintage pre-loved fabrics. Sourced from a "top-secret" warehouse in Rajasthan, India, one can only muse about the woman this beautiful silver and pea-green sari fabric once adorned. Now rescued and repurposed with the addition of deliciously soft fur, it's an utterly unique piece of eco-couture awaiting new adventures. NZ Wild Rabbit Eco Fur yoke & collar, 100% Silk Crepe de Chine lining (chocolate brown), 50% wool 50% cotton interlining.